This past week, former Sabre CEO Kathy Misunas and I decided to publish an updated edition of our book on Multi-Channel Distribution - The Essential Guide, which was originally published a decade ago. That book was a part of the Travel Distribution Library, a three book series on global travel distribution. 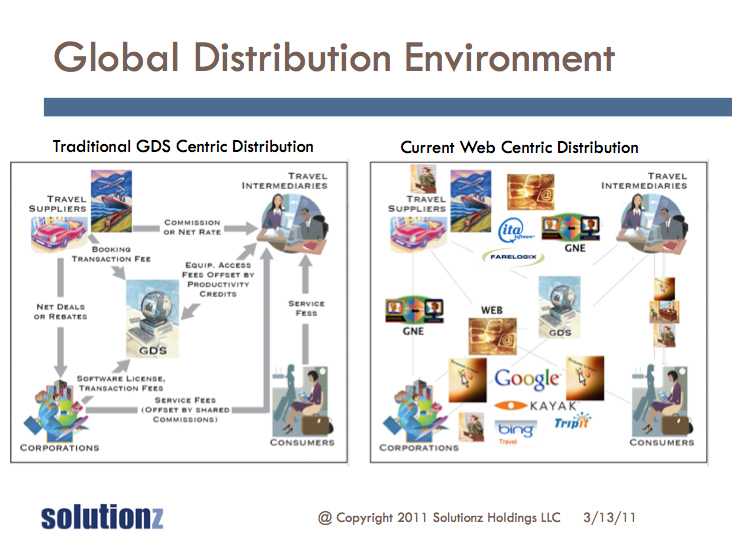 In the original book, we talked about the GDS centric distribution model, which is the model shown on the left. In this model, the GDS sat at the center of many of the transactions between the supplier and the consumer/business traveler. The percentage of involvement varied from sector to sector and from supplier to supplier within the sector. The diagram on the left shows the flow of funds to and from each of the various parties to the travel transaction, from the travel supplier, through the technical intermediary (the GDS in this case), through the distribution intermediary (online and offline agencies), all the way through the corporate travel department to the corporate traveler and also to the individual consumer. On the right is what the travel industry distribution model looks like today. 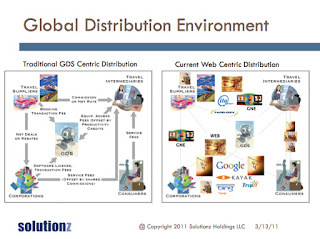 A decade later, we now see that the distribution environment has shifted and is largely web-centric. Although the GDS companies still play a role, they have seen their business impacted by the supplier push toward consumer direct distribution. We also see a number of new players. ITA and Farelogix have been known as GDS New Entrants, or GNEs. One would argue that more than a decade after their entrance onto this scene, they are no longer "new". Also, you see various other players on the web front, including Google, Kayak, Bing, TripIt, etc. While not an exhaustive list, it is an example of the impact of search and meta-search on the travel ecosystem and also the level of fragmentation that exists. We hope to have the book out before summer time. Stay tuned!